See? She was actually waiting to walk until she had her shoes! Haha, how did she know?! I’m entranced by her funny ambling about when tired! I love the way Clark’s do the little photo and gift box. I’ve kept Dexter’s. I just can’t get over how expensive they are though! 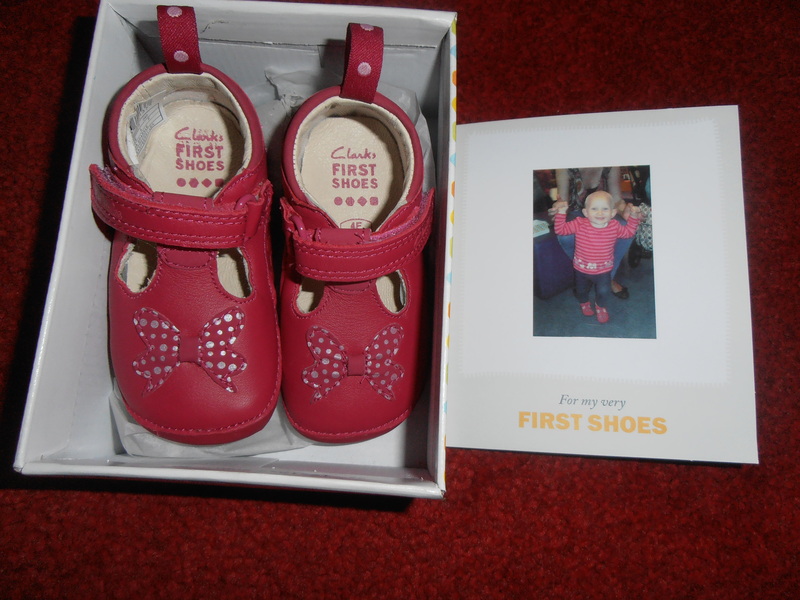 Dexie’s first shoes were £30 – I don’t spend this on shoes for me!!! I know, these are cruisers so were under £25, it’s bad that I don’t want them getting scuffed etc so we can keep them, right?! I was a bit disappointed her first shoes weren’t the red patent mary janes I’d had in mind but they’re sweet with the little bows! Lovely shoes, Ethan had the same kind but we never had a picture taken :0(. Ethan was 16 months old when he took off. I love that she is also playing with her socks.